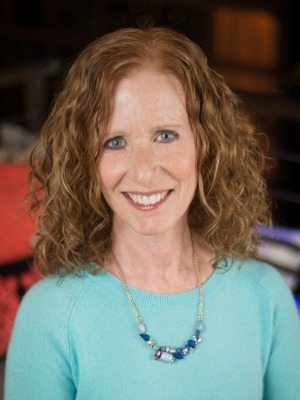 I am so excited about a blogging event that I get to be a part of. See the little brown and red banner on the right side of the page? 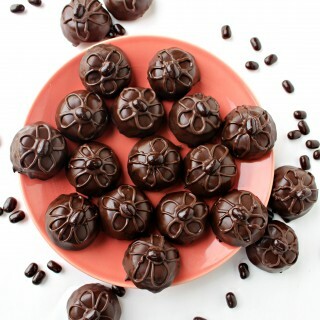 I am one of the 575 international food bloggers registered to participate in The Great Food Blogger Cookie Swap 2012! This huge undertaking is coordinated by Lindsay from Love and Olive Oil and Julie from The Little Kitchen , and has raised over $4,600 for Cookies for Kids’ Cancer. The registered bloggers are divided into groups of four, matching for food restrictions (allergies, veggie/vegan, kosher, etc.). Some time in the next week I should receive the names and addresses of my 3 other group members. 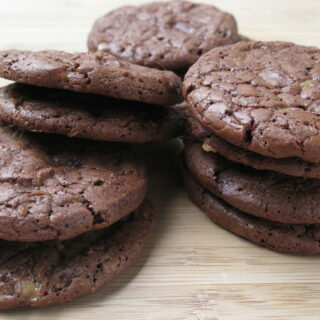 Then I bake some wonderful cookie recipe that I have not yet blogged about (and at the moment haven’t yet figured out). I will ship one dozen of these culinary masterpieces to each of my group members by December 5. They in turn will each mail me one dozen of their cookie creations. 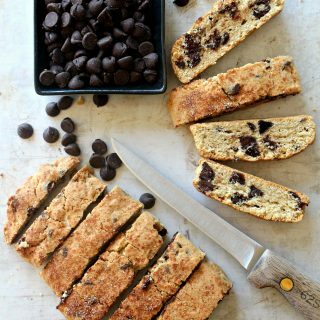 If you are into cookie recipes, here comes the cool part. On December 12, all 575 bloggers will post their cookie swap recipe. 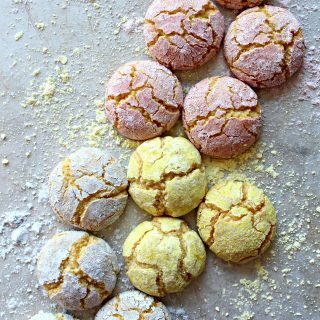 Cookie enthusiasts will be able to follow links on Love and Olive Oil and The Little Kitchen to all 575 recipes. Did I mention that I am really excited about this? Not only do I get mail containing cookies, but for the first time this little blog becomes part of something bigger. The Monday Box is officially launched into the world of food blogging. 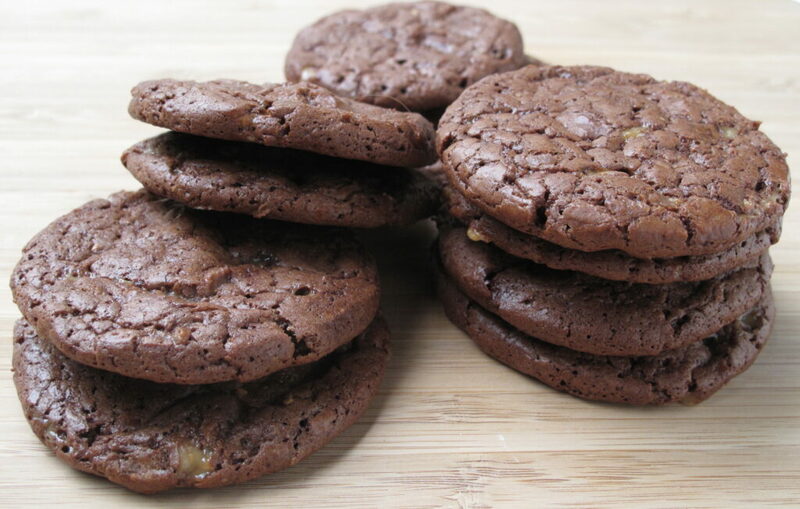 These Chocolate Toffee cookies are definitely worthy of any cookie exchange. 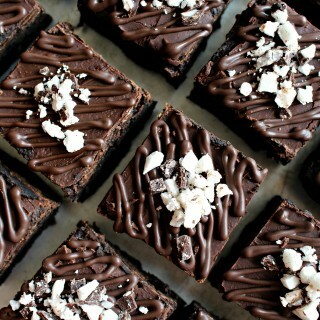 They are rich and chocolate-y and chewy. A candy bar in cookie form. 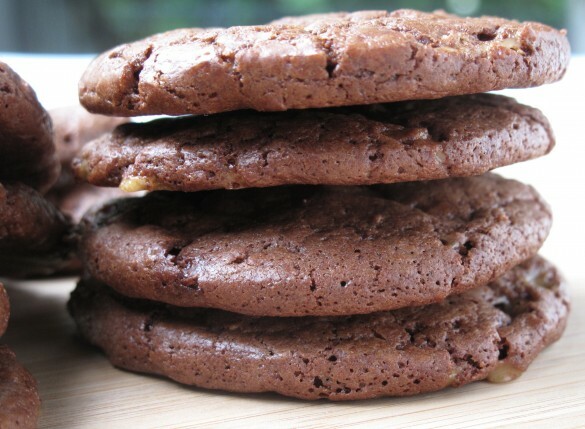 Chocolate Toffee Cookies are also on my son’s Top Three Favorite cookies list (along with these and the New York Times Jaques Torres chocolate chip cookies pictured on the home page banner). I barely tweaked the recipe from Smitten Kitchen and she adapted it from Bon Appetit. 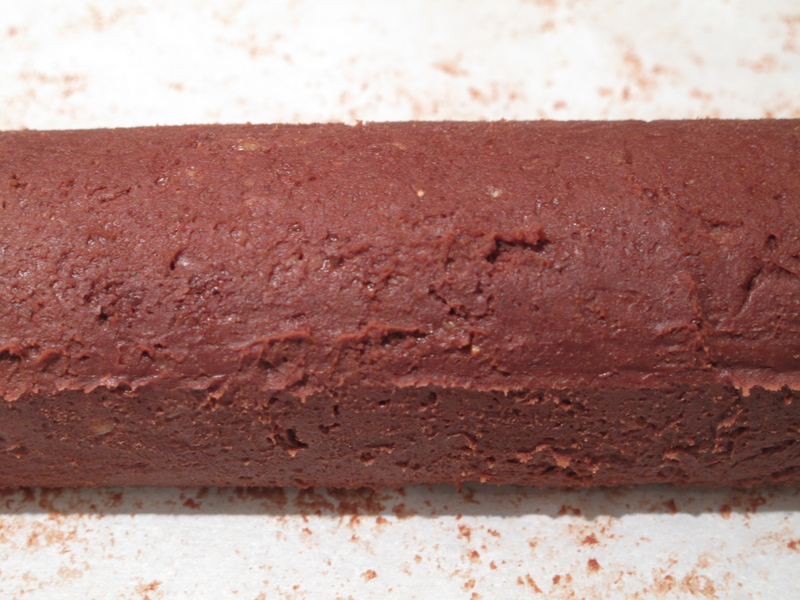 I make this dough into logs and store it in the freezer, forever raising the bar for slice and bake cookies. Sorry Pillsbury. 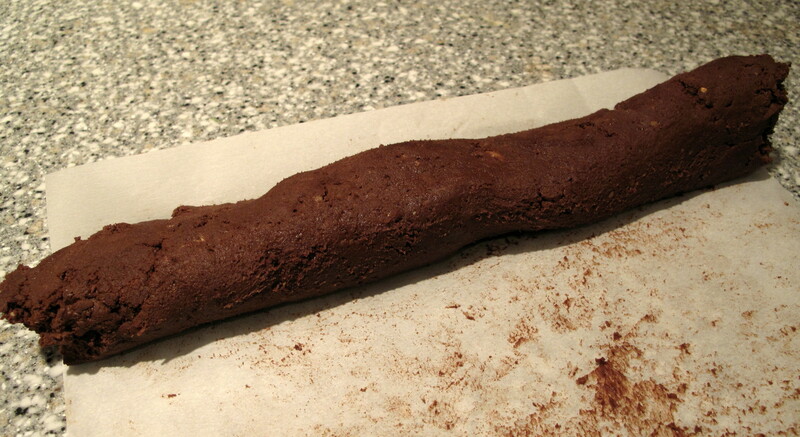 This dough is rather soft and sticky, even after chilling. To keep the logs round I insert them into paper towel tubes. 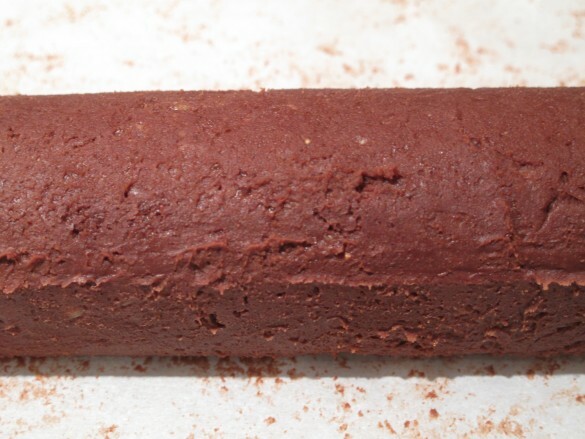 Either roll out your log to the same diameter as the tube opening and slip the dough inside, or cut the tube open from end to end and pry apart to put your log inside. 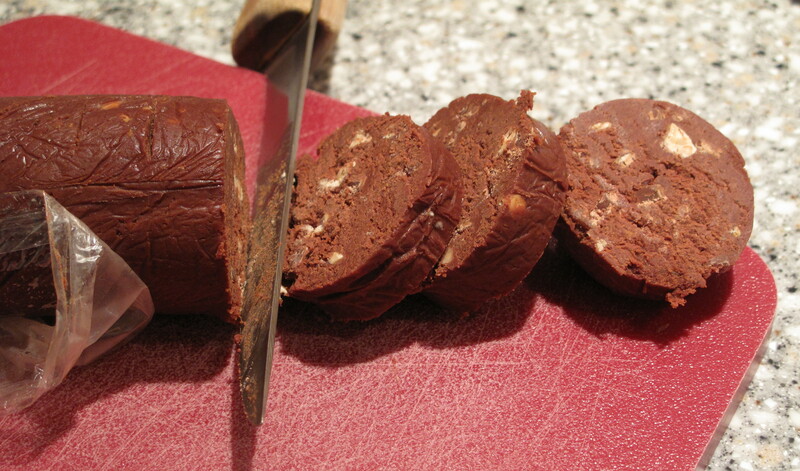 Without the tubes, the bottom of the log flattens in the fridge/freezer and you end up with sort of oval shapes when sliced. 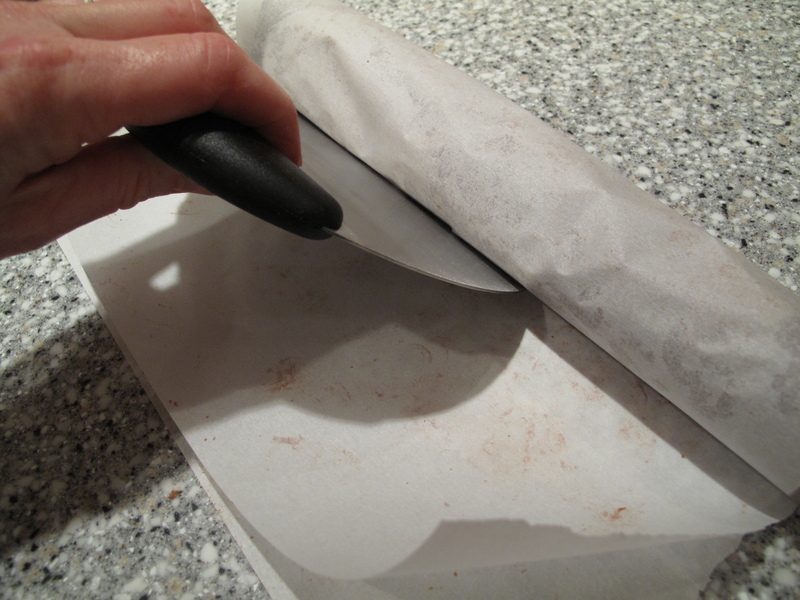 Tip for making compact round dough log: On top of a sheet of parchment paper, form the dough into a log by hand until roughly the desired diameter. Place the log into the center of the paper. Fold the parchment over the dough and push a ruler edge or dough scraper against the bottom of the log to remove air pockets and compress the dough. 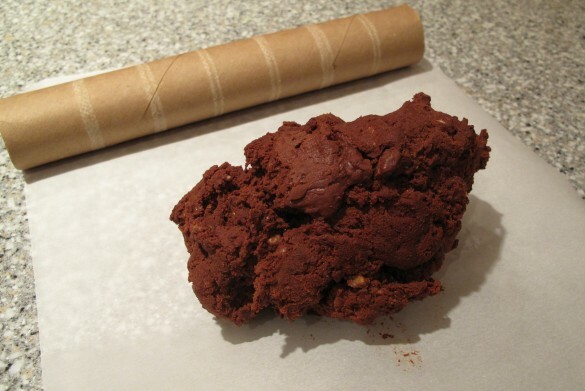 If refrigerating, the dough can be wrapped in the parchment before slipping it into a paper towel tube. 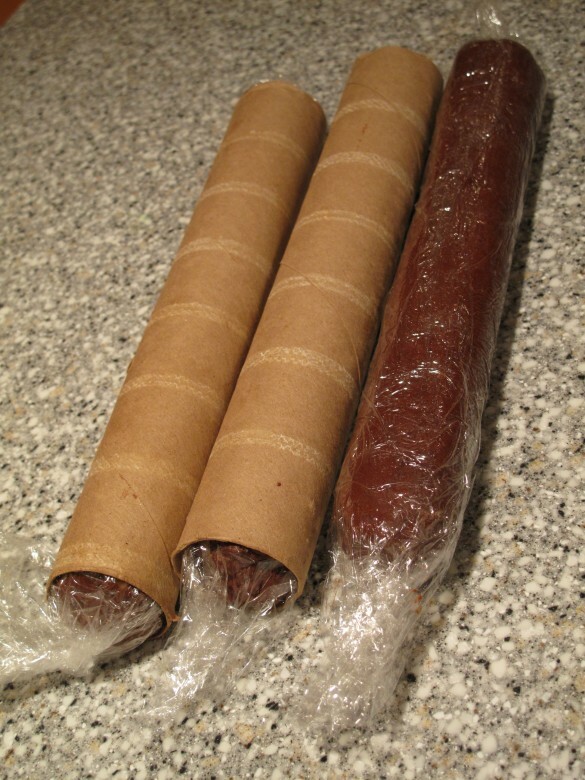 If freezing, wrap the log in plastic wrap, with or without the parchment paper, before inserting into the tube. Though the rich sweet flavor stays the same, the chewy texture is lost over time. For optimal texture Chocolate Toffee Cookies can be kept airtight at room temperature for 3-5 days. Using a double boiler, melt chocolate and butter stirring until smooth. Cool slightly. With an electric mixer, beat sugar and eggs until thick, about 5 minutes. Mix in chocolate mixture and vanilla. Add flour mixture, mixing until incorporated. Stir in toffee pieces. Chill batter until firm (about 45 minutes) or overnight. 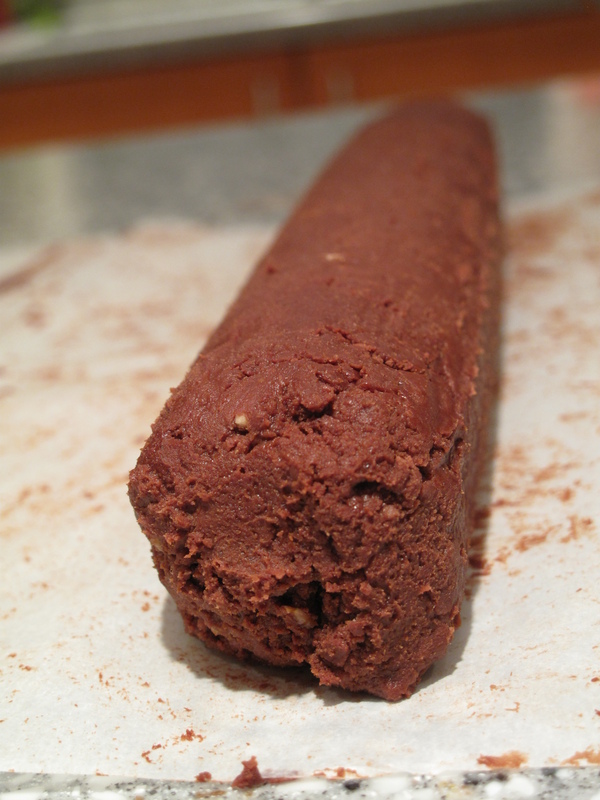 Roll dough into three logs approximately 1.5” in diameter. Baking: Preheat oven to 350 degrees F. Line baking sheet with parchment paper. Slice cookies into ½” slices and space 2” apart on prepared baking sheet. Bake 12-14 minutes (from frozen, not defrosted) until cookies appear dry and crackled but still soft to the touch. Cool on wire racks. Wrap cookies in plastic wrap in pairs with bottoms together. Place wrapped bundles in an airtight ziplock bag or container for storage. For optimal chewy texture, store at room temperature for 3-5 days. Never miss a new delicious recipe! Sign up to receive email updates from The Monday Boxand bake some love today! 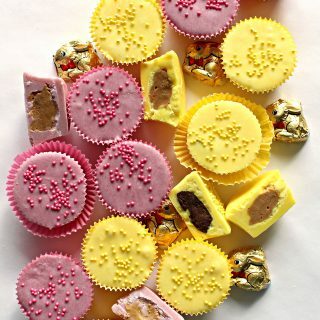 Check out our tasty treats on Facebook , fabulous finds on Pinterest , and follow our story on Instagram too! Thank you, RaShell! 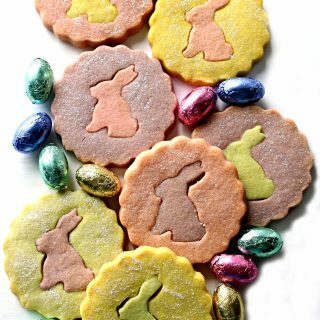 These cookies are on my son’s top three favorite cookies list and he has taste tested a LOT of cookies 🙂 I’m glad you clicked over from #LouLouGirls! 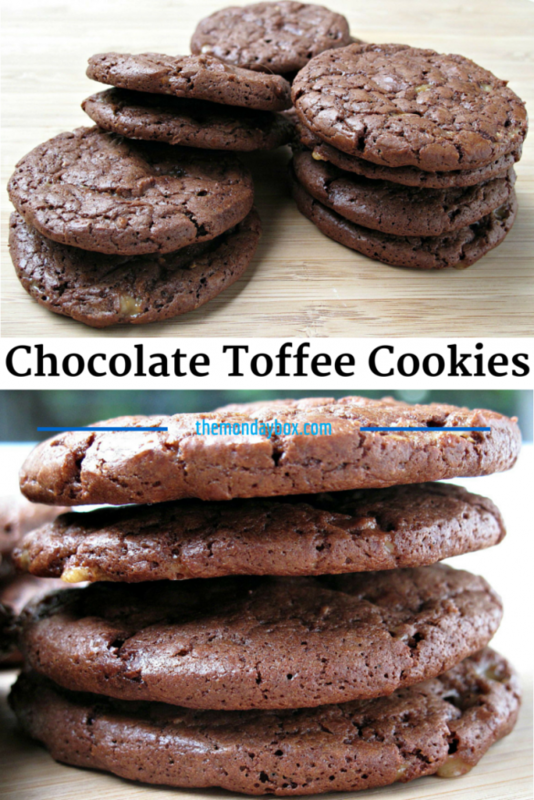 Chocolate and toffee in the same cookie?! These have to be good! Thanks, Ellen! It’s a great flavor combination! The cookies sound great & I love all the tips!! Thanks so much for sharing with us at Throwback Thursday! !